Stopped by a Singapore McDonald’s lately? Then you’re sure to have seen their new line of fish-themed eats that sound pretty promising to fans of the classic Filet-O-Fish, plus the infamous chocolate pie, aka ‘choco pie’, that was a hit in South Korea. Curious to know if they’re worth the calories? We tried all their items in true investigative fashion. 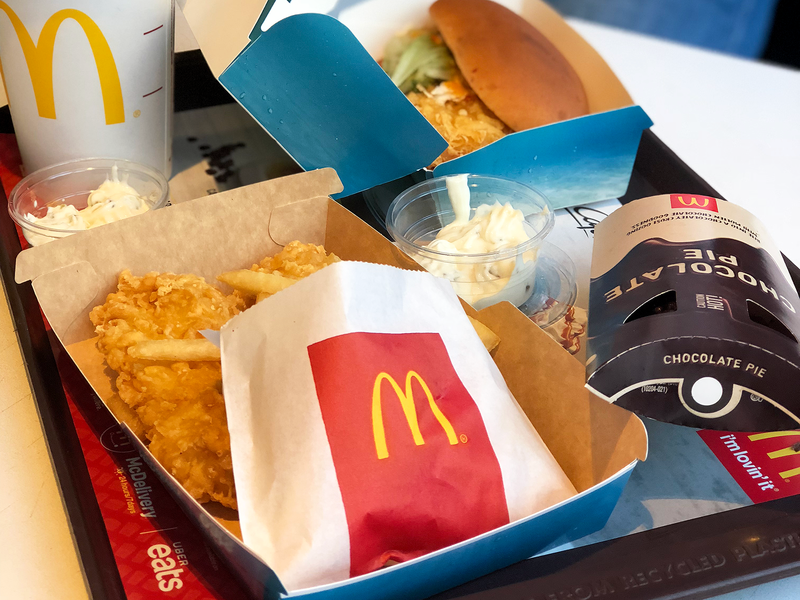 Expectations: Tender fish encased in a thin layer of batter and fried to crispy, golden perfection, paired with classic McDonald’s fries and accompanied by a side of salty-sour tartar sauce – what’s not to love? Reality: The batter is rather good – crunchy and not overly oily – but we felt that the fish inside was just a bit too dry and tough, and had a somewhat fishy taste in the middle. At $7 for the a la carte option, the Fish & Fries should do better. Expectations: The Sweet Chili Fish Burger is a dream come true for Singaporeans and people who love seafood and chili. It’s an addictive whirlpool of flavours – a spicy kick, soothing sweetness, tender fish wrapped in crispy batter, all sandwiched between fluffy buns. Reality: The sweet chili sauce looked a little sparse at first glance but turned out to be flavoursome enough. It had the promised sweet-and-spicy flavours; more sweet than spicy, if we’re being honest. Good for those who can’t handle too much spice, but not to so great if you’re used to a punchier kick. We couldn’t really taste the fish though – the sauce only looked sparse but was actually very overpowering – and the texture was mediocre. If you’re looking for a McDonald’s fish burger, we’re not sure if you’d be willing to fork out $7.50 for the meal. We’d still recommend the classic Filet-O-Fish instead. Expectations: Not a fan of fish? Don’t you fret, landlubber – there’s still something for you. McDonald’s hit chocolate pie has finally washed up on Singapore’s shores! This decadent dessert features velvety melted chocolate held together with a light, crunchy chocolate pastry that will have you falling in love at first bite. Reality: When we broke open the warm pie, we were pleased to see chocolate oozing temptingly out the middle. It tastes pretty good too, with a rich, semi-sweet flavour profile that’s more quality dark chocolate than sweet milk chocolate. Nothing can beat a proper chocolate lava cake, but considering we paid just $1.40 for this, we were pleasantly surprised how good a low budget alternative this was.